“I was watching these corals dying from the abnormal increase in seawater temperature and light. In 2004 we lost 24% and in 2009 50% of the coral cover in some of our lagoons. It could be that eventually climate change will disseminate most of these coral species, but at least we would have done our best to save them.” Dr Ruby Moothien Pillay, Principal Research Scientist for the Mauritius Oceanography Institute (MOI) says. Attempts to save the coral reef have led to a series of embarrassing ecological disasters. Osborne Reef, was a site chosen in the early 1970s in Florida, USA, were two million tyres were dumped underwater to create an artificial coral reef. The result was a sea bed full of tyres that smashed and bounced all over each other, damaging any life that may have settled on them, as well as the natural reefs nearby. The island of Mauritius, despite often being depicted as an underwater Garden of Eden, is not immune to the coral crisis. Mauritius’s 870 km2 reef area have been damaged by cyclones, population and economic growth, global warming, overfishing and even algae growth caused by sugar cane fertiliser being washed into the ocean. The situation is so dire that the Mauritian Marine Conservation Society (MMCS) tells divers that the lagoon is of little interest as fishing and pollution have chased away the inhabitants. 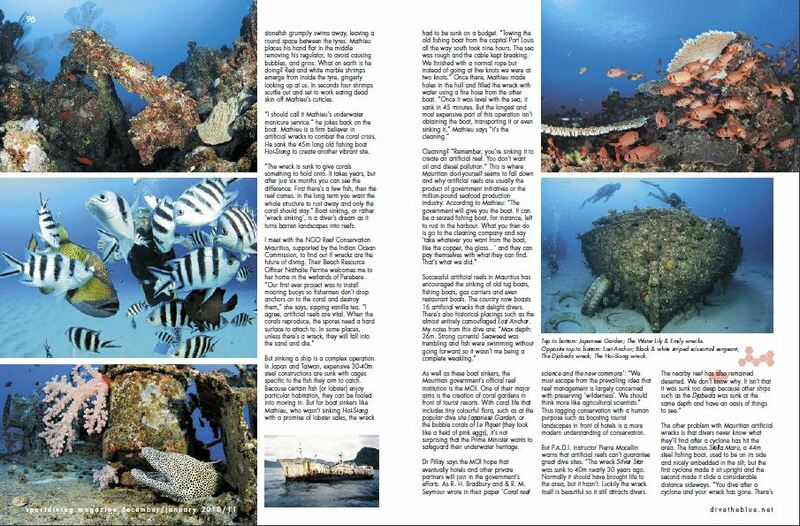 They recommend that divers go beyond the reef and preferably opt for purposefully sunken wrecks. Mathieu Bayon, a French underwater photographer living in Mauritius, says he can show us a viable solution, if we follow him 25 metres below sea level. Mathieu takes me down to see Mauritius’ oldest wreck, the ship Water Lilly sunk in 1980. I throw myself off the back of a boat in full diving gear and follow Mathieu down to a patch of underwater desert. Water Lilly lies beside a second wreck Emily and scattered between them are the wretched tyres, although not two million of them, only about a dozen. Thirty years underwater has successfully grown hard and soft corals over both wrecks. There are brain-like sinularia corals, as well as false black coral, which is actually a bottle green colour and looks like a giant game of Tetris. There are also molluscs and clams smiling inside the round, hard corals like vibrant lips. The artificial reef has attracted a triggerfish with buck teeth who swims over spinning his bulbous eyes to check us out. A shy moray eel also lives on the wreck, poking her long face out of a hole in the deck. Shawls of bluestripe snapper and black and white striped scissortail sergeant swim by peacefully between Water Lilly and Emily. One particularly brave butterfly fish dives head first into Mathieu’s jacket pocket, to try and eat some bread. He then follows him for the rest of the dive, slipping in and out of his pocket, like a yellow letter in an envelope. After noting the success of Water Lilly and Emily, I swim over to analyse the surface of the tyres. They are covered in sand and green algae. Mathieu, noting my scepticism, waves at me to follow him. A stonefish is floating between two tyres. Mathieu wiggles his finger at him and he swims away leaving the space available for Mathieu’s hand, which he places flat in the middle. Then he grins at me from behind his regulator. I stare, wondering what on earth he is trying to say, then suddenly notice red and white marble shrimps stepping out of the inside of the tyre. They set to work, eating dead skin off Mathieu’s cuticles. It seems that when you sink tyres in their dozens, in key sites such as beside two imposing wrecks, they can become home to shrimp fishy parlours. “I should call it Mathieu’s underwater manicure service.” He jokes once we are back on the boat. Mathieu is a firm believer in artificial wrecks and was chosen to sink the 45 metre long Hoi-Siong: an old fishing boat just off the coast of Le Morne on the south west point of the island. “The wreck is sunk to give corals something to hold onto.” He says, brushing his sun-bleached hair back with a hand wrinkled from our dive. “It takes years, but even after six months you can see the difference. First you see a few fish and then the reef comes. In the long term you want the whole structure to rust away and only the coral should stay.” Boat sinking, or rather ‘wreck sinking’ as these divers call it, turns desert landscapes into reefs. But the sinking of a ship is an expensive operation. Mathieu’s job as a boat sinker involved tugging an old fishing boat from Port Louis, the capital, all the way to the south. “It took us nine hours, the sea was rough and the cable kept breaking. We finished with a normal rope but instead of going at five knots we were at two knots.” Once there, Mathieu’s work consisted of making holes in the hull and then filling the wreck with water using a fire hose from the other boat. “Once it was level with the sea, it sunk down in 45 minutes. But the longest and most expensive part of this operation isn’t obtaining the boat, transporting it or even sinking it,” Mathieu says “it’s the cleaning.” Cleaning? “Remember, you are sinking it to create an artificial reef. You don’t want oil and diesel pollution.” This is where the Mauritian do-it-yourself method seems to fall down and why artificial reefs are usually the product of government initiatives or the million pound seafood production industry. In Japan and Taiwan, most of the efforts of the seafood industry have been focused on design and construction units. You can find 30 to 40 metre high steel constructions with cages specific to the fish you aim to catch. Because particular fish (or lobster) enjoy particular sorts of habitation, you can fool them into moving in. But for Mathieu, who was not sinking Hoi-Siong for fishing purposes, or on behalf of the Mauritian government, the wreck had to be sunk on a budget. “The government will give you the boat,” he says. “It can be a seized fishing boat for instance that was left to rust in the harbour. What you then do is go to the cleaning company and say ‘take whatever you want from the boat, like the copper, the glass…’ and they can pay themselves with what they can find. That’s what we did.” The success of artificial reefs in Mauritius is such that it has encouraged divers to sink old tugboats, fishing boats, gas carriers and even restaurant boats. The country now boasts sixteen artificial wrecks. As well as these boat sinkers, there are also official organisations working on the protection of coral reefs in Mauritius. Two such organisations are the Indian Ocean Commission (IOC), an intergovernmental organization funding local NGOs, and the Mauritius Oceanography Institute (MOI), a research organisation functioning under the aegis of the Prime Minister’s Office. One of the major aims of the IOC reef surveillance program is to safeguard the coast from cyclones. As for the MOI, they are developing a coral farming project for tourism, export, education, research and conservation. It seems a little worrying that the first aim sited in the coral farming project of the MOI is “the creation of coral gardens in front of tourist resorts.” On the other hand, by giving a human-centric and commercial aim to the presence of a vibrant coral bed, the island of Mauritius may actually succeed. “We must escape from the prevailing idea that reef management is largely concerned with preserving ‘wilderness’. We should think more like agricultural scientists. Humans have developed a whole spectrum of levels of exploitation, control and management of natural systems.” The suggestion is that coral reefs are tagged with a human purpose such as boosting tourist landscapes in front of hotels or acting as a buffer for cyclones. The objective is to think of corals like we do crops. Dr Pillay agrees, she explains that part of the coral farming project is research in zooxanthellae genetics. “We are conducting experiment on our farmed grown corals to study the shuffling of their symbionts once they are placed back at sea.” For the non-underwater scientists amongst us, this means they are creating land cultures of tough corals that might be able to resist global warming. Bradbury and Seymour warn that using corals to serve one purpose may end up making corals political. The result could be tragic, say if reefs were reinforced to buffer coastal erosion but ended up blocking off turtle breading sight. I make my way to meet with an NGO supported by the Indian Ocean Commission, to find out if they have big plans to make corals political. The NGO in question is called Reef Conservation Mauritius. Nathalie Perrine their Beach Resource Officer, welcomes me to her home in the wetlands of Perebere. “Our first ever project was to install mooring buoys, so that fishermen don’t throw anchors which will fall on the coral and destroy them.” She says, sipping vanilla tea. “We hoped the government would follow suit and they have done so to a certain extent. When there is a lull in the fish, we train the fishermen to do ecotourism instead. We also have a country-wide education program on endemic species for 9 to 10 year olds.” I ask her how linked the NGO is with the Mauritian government. “The minister of education is supporting us in so far as he allows us to go into the schools and present our facts.” She says and then explains they are also creating a marine park in Balclava. In the eyes of Bradbury and Seymour, an underwater sanctuary counts as ‘set aside wilderness with very low exploitation’, one of the gentler forms of agricultural management. But how about artificial reefs? “They are vital.” Nathalie says without hesitation. “When the corals reproduce, the spores need a hard surface to root to. In some places, unless there is a wreck, they will fall into the sand and die.” But one divers isn’t so sure. P.A.D.I. 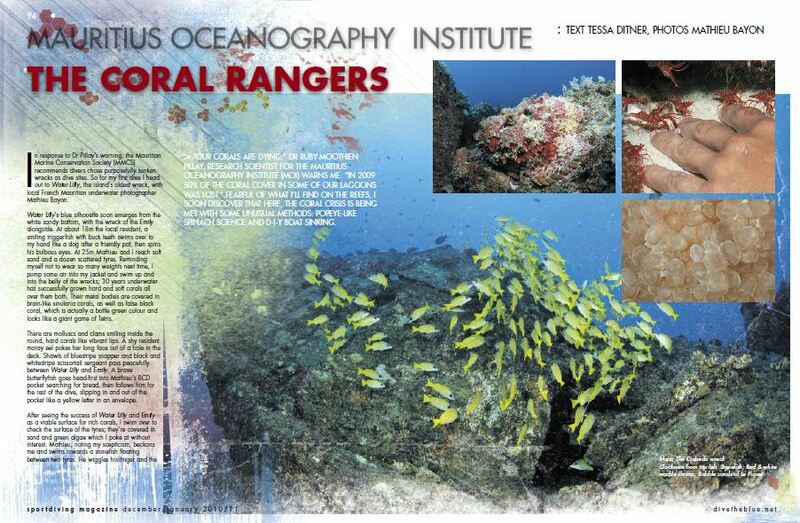 instructor Pierre Mocellin warns that sinking a ship will not guarantee the arrival of corals. The other problem with artificial wrecks is that divers never know what they will find after a cyclone has hit the area. The famous Stella Maru, a 44m steel fishing boat sitting at 22 metres, used to be on its side and nicely embedded in the silt; but the first cyclone made it sit upright and the second made it slide a considerable distance sideways. “You dive after a cyclone and your wreck has gone. There’s nothing but sand!” Pierre says. “It’s a bit embarrassing in front of your clients.” I have a thought for those shrimps with their manicure business in the tyres by the Water Lilly. I wonder what a cyclone would do to their home. Having noted the activities of NGOs, individual divers, government and intergovernmental organizations within the island of Mauritius it becomes clear that conservationists have already adopted what Bradbury and Seymour’s call ‘humanreef’: the interconnectedness of coral reefs and human activity. Coral death has gone too far to be left alone to return to a ‘Garden of Eden’ state. The problem is, can every purpose be fulfilled simultaneously and if not, which comes first? Whilst some safeguard endemic species, others grow tough species that might be able to survive climate change, others aim to link tourism in with conservation or to safeguard the coastline from cyclones and some individuals sink boats like landscape gardeners turning desert into life. It’s a hard choice, but they all have the honour of working with corals: a primitive living animals, the oldest of which are celebrating their 500 millionth birthday this month. Images: Published photographs by Mathieu Bayon. Mathieu is a French/Mauritian diving instructor and photographer who lives in Mauritius. He represented Mauritius in the world championship of underwater photography in Korea. Photography includes images of the sinking of the Hoi-Siong, underwater images of Mauritius’ artificial wrecks and coral reefs.